Washington's high temperature of 96° last week seemed just a bit too high to end the near-record string of 90°+ temperatures this year. Sure enough, the temperature popped up this afternoon ahead of some light rain showers and hit a high of 92°. This is the 63rd day of 90° or higher temperatures this year, although the pace has now slipped a couple of days behind the record year of 1980, which eventually reached a total of 67 days. 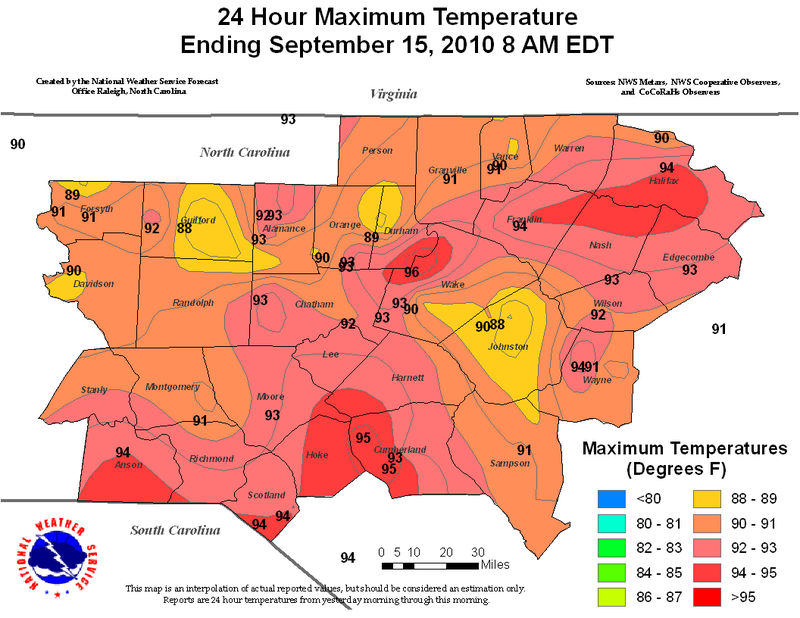 Raleigh, which had just tied its annual record yesterday, broke the record with its 84th day this year of 90°+ temperatures and a high of 94°. Richmond, which also hit 94°, extended its new record to 74 days. The Weather Channel twitches that today's 90°+ temperatures in Raleigh NC have tied the annual record of 83 days in 2007. Highs in the lower 90s are also forecast for Thursday and Friday. Meanwhile, Richmond VA broke its record for number of days of 90° or higher temperatures with 71 a week ago on Sept. 8. With a high of 92° yesterday and a temperature of 90° at 4 pm today, that record is now 73 days. The old record of 70 days was set in 1977. 5 PM Update: As of 5 pm EDT, Julia has weakened slightly to Category 3 (125 mph), but Igor remains at Category 4. Although there has been minimal direct effect on the U.S., the 2010 hurricane season has been setting records for storm intensity. In his WunderBlog this morning, Dr. Jeff Masters notes the significance of Hurricane Julia's intensification to Category 4. Along with Hurricane Igor, which reached the maximum intensity of the Category 4 range last night, there are now 2 Category 4 hurricanes in the Atlantic at the same time. The only other time this has happened was with the Great Miami Hurricane and Hurricane Four on September 16, 1926. On that occasion, the double Category 4 storms only overlapped for 6 hours. However, Julia became a Category 4 at 5 am this morning and is expected to remain at least at this intensity through the rest of Wednesday. Although Igor has weakened slightly, it is also expected to remain near its current strength for at least the next 24 hours. Another record, already set by Julia, is that it is now the strongest hurricane to develop this far east in the Atlantic (longitude 31.8W). Hurricane Earl was also the fourth strongest hurricane so far north. This season so far has the third highest number of Category 4 storms, behind 2005 and 1999, which had 5 each, but today is the earliest that a fourth Category 4 storm has formed. Julia's development beat Hurricane Gert of 1999 by 3 hours on the same date, September 15. The pace of Category 4 storms (4 in 20 days) is also a new record, beating the previous shortest span of 24 days in 1999.